I’m happy to welcome another guest poster to our little family here – My dear hubby Brett! We recently switched to Greek-style yogurt at home. So we decided to do a taste test of one of the most popular fruit flavors out there. Yogurt has always been one of my favorite snacks. The all time greatest for me is Dannon’s coffee-flavored yogurt. The rich taste of coffee in a fun-size snack was enough to fill me up. Recently, my wife has discovered a love for Greek yogurt. It is a love bordering on obsession. Every time we head to the supermarket we end up with five or six packages to head home with. I may pick on her about her new-found food crave, but Greek yogurt has less sugar, less fat and is higher in protein than it’s regular yogurt brothers and sisters. Because of this, it is a snack that I am happy she enjoys. Christina decided that she wanted to do a taste test of blueberry Greek yogurts. We decided on blueberry because almost every company has a blueberry yogurt. 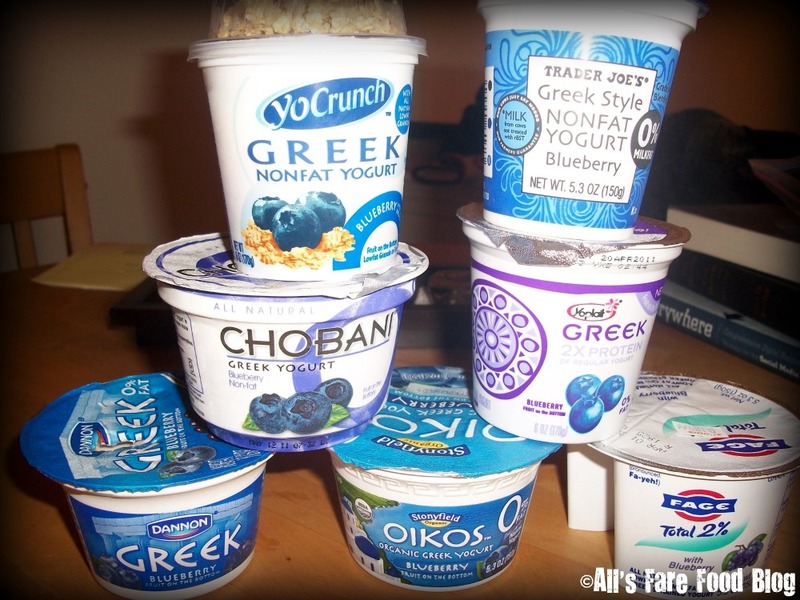 The seven contenders in alphabetical order are Chobani®, Dannon®, Oikos™ (by Stonyfield), Fage™, Trader Joe’s, YoCrunch® and Yoplait. To keep it fair, we decided to leave the crunchies out of the YoCrunch yogurt. My job was to come up with a grading system and help with the tasting. I decided on a scale of 1 to 5 to rank the yogurts on the amount of blueberry flavor, the consistency, the amount of fruit and sweetness. Our ideal yogurt would have a lot of blueberry flavor, be thick in consistency, have a lot of visible fruit and not be overly sweet. Our rankings from top to bottom were almost identical. Chobani came in as top dog, followed by Fage, Yo Crunch, Yoplait, Dannon, Oikos and Trader Joe’s. Chobani has the best blueberry flavor and a thick and hearty consistency. The amount of fruit was at the top of the contenders, and it was sweet, but not too sweet. Fage had excellent consistency and more visible fruit than Chobani. It lacked in the sweetness department and had very little blueberry flavor. It also had two compartments, one for the yogurt and the other for the blueberry. After I dumped the fruit into the yogurt it became very difficult to stir. My loving wife read the directions on the side of the container and it said, “Don’t mix together.” First off, why the hell would I need to read directions when eating yogurt and secondly, what do you mean I shouldn’t mix them together. It seemed like a lot of work to get a spoonful of yogurt and then dip that into the blueberry mixture. But maybe that’s just me. YoCrunch and Yoplait came in tied. My wife thought that YoCrunch had an after-taste like sugar cookie batter and I felt that Yoplait had an off-putting flavor. Both had very little blueberry flavor and Yoplait’s tasted fake. Dannon had no blueberries and had a consistency that was whipped and over processed. Christina commented that it was fruit gel on the bottom and the consistency reminded her of marshmallow fluff. I’m just throwing this out there, but it doesn’t bode well if your yogurt tastes like marshmallow fluff. Coming in second to last, Oikos was runny and had no blueberry flavor. You could see blueberries on the bottom, but they didn’t taste like blueberries. The consistency reminded me of regular yogurt not Greek. Dead last was Trader Joe’s. I am a huge fan of their products. Every week we usually stop by the store on Rt. 114 in Peabody, Mass., to see what is available, but their Greek yogurt was terrible. I was the one that was lucky enough to take the first bite. My wife laughed at me while I was gagging and I could see it in her eyes that she was having second thoughts about taking a bite herself. It was unbelievably gritty and tasted off. I attribute the strange flavor and consistency to the cornstarch that was in the ingredient list. Definitely wasn’t their best effort. So there you have it. Chobani wins the day. With no fat and only 140 calories, it is a fun and delicious snack the whole family can enjoy. Now after eating seven different blueberry-flavored Greek yogurts, I feel like Violet Beauregarde from Charlie and the Chocolate Factory. Can somebody take me to the juicer and squeeze out all the blueberries I ingested. Please? This entry was posted in Taste Test and tagged blueberry, Brett Finnell, Charlie and the Chocolate Factory, Chobani, Dannon, Fage, Greek yogurt, guest blog, Oikos, postaweek2011, snacks, Stonyfield, taste test, Trader Joe's, Violet Beauregarde, YoCrunch, Yoplait by Christina. Bookmark the permalink.